On the face of it, a 41-year old British car with an antiquated engine that produces just over 100bhp has no business being in a section called Fast Fleet. However, C&P has always championed not just power or outright speed, but the Thrill of Driving. And in this, my old timer has always scored highly. With the UAE summer months making it impossible to drive anywhere, I tend to use the time getting it prepped for winter, when I use it as often as possible (it’s basically my daily driver for six months a year), and this time around it’s been treated to a comprehensive overhaul of its underpinnings. Two summers ago I had the engine stripped and rebuilt, and it hasn’t missed a beat since. But the suspension has been making increasingly loud groans and it’s suffered from horrific brake squeal since new discs were fitted – something I’d been wrongly assured would ease off once they were worn in. 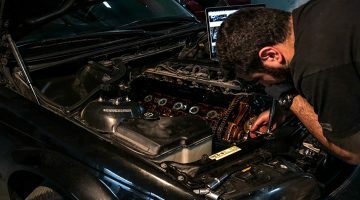 One of the biggest hurdles to overcome when running a relatively obscure classic car in Dubai is finding a garage or mechanic who knows what they’re doing. The engine’s maintenance isn’t much of an issue because, as I quickly discovered after importing it, most Filipino mechanics have worked on similar units for decades. It’s the rest of the car that seems to have others confused but eventually, I discovered ACM in Dubai Investment Park, which is a subsidiary of Alain Class Motors. Before heading off for a month’s holiday, I dropped off the TR6 with them and arranged for the required spares to be delivered from Rimmer Bros in the UK. A complete set of bushes (including those for the diff), a new steering rack, new brake pads and new brake and clutch master cylinders were on the shopping list ACM had provided and now they’ve all been fitted. The result, as I discovered during a recent test drive, is a car that’s been completely transformed. Now I need fear no embarrassment as I drive over speed humps in areas packed with pedestrians, as the car’s suspension settles without making a sound. The brakes, too, are silent and efficient in operation and I can enjoy that lovely straight-six rumble all the more as a result. 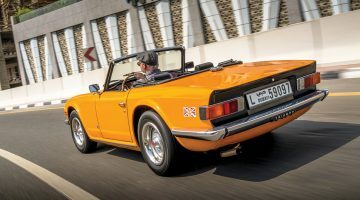 That engine is at the heart of the TR6’s appeal to tens of thousands of enthusiasts around the world and, mine previously being a resident of California, is in a lower state of tune than many others, due to the strangulation of 1970s emissions controls. It’s fitted with two irksome SU carburettors (unlike the European models, which came with primitive Lucas fuel injection) that require constant fettling but they rarely present a problem to local mechanics. And despite the feeble power output, with a kerb weight of just under a ton, it moves along at a rollicking pace. It always feels much faster than it actually is, helped by its low centre of gravity, the low driving position, its miniscule proportions, the heaviness of the controls and the fact that I rarely, if ever, drive it with the roof up. 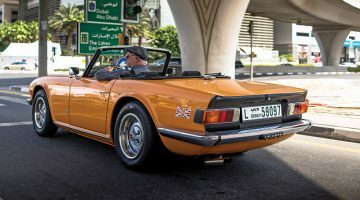 As I look forward to a few glorious months of old school classic motoring, the Triumph is undergoing its final stages of an extensive paint detailing at Dubai’s District 31. That won’t be cheap but I know that when it emerges at the end of October it will look as good as it now sounds and goes. ENJOY OUR TRIUMPH TR6 LONG TERM REVIEW?